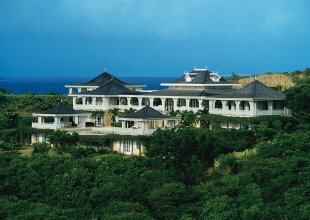 Ilanga is a modern Colonial-style villa situated on the south eastern end of Mustique with sweeping views over the Atlantic Ocean towards Rabbit Island. 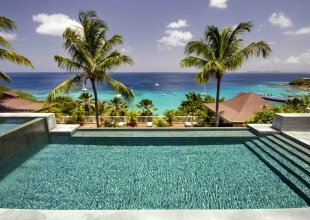 Relaxed, tropical life is embraced here - with its open air style of living. The appealing courtyard layout of the villa is centred on a private, curved swimming pool and beautifully landscaped gardens. With its intertwining of indoor and outdoor living areas, there is plenty of space with idyllic areas for guests to retreat to. All five, fully air conditioned, bedrooms have their own bathroom and dressing room and open onto their own private verandah, all perfectly suited to the relaxing island lifestyle and taking full advantage of the views and breezes. There is also a media/entertainment room with broadband access. Cool and contemporary, Ilanga exudes sophisticated charm. With its classical style pillars and huge windows and doors, it encompasses luxurious indoor and outdoor living and embraces its tropical surroundings. Its cool stone floors, and pale walls and soft furnishings create an atmosphere of understated elegance. All the bedrooms are of a good size, extremely comfortable and feature crisp, white linens. Four efficient and caring household staff will look after you for daily housekeeping, laundry, all cooking services and general assistance. Most provisions can be ordered onto the island from St Vincent and there is an on-island grocery store and fish market. Menus and special dietary requirements and requests can be discussed prior to your arrival. Alternatively, wait until you are on-island to discuss your food preferences with the chef or butler or where you might like to dine - perhaps have a BBQ on one of nine spectacular beaches, or choose a candlelit setting within the romantic gardens of villa Ilanga. Ideal for families, the villa has a household team of three staff. All shopping and food and beverage orders will be collected by your villa staff on your behalf and every effort will be made to meet your requests.